Get an in-depth look at the beautiful landscapes of Sri Lanka’s hilly interior during this 8-hour private day trip. 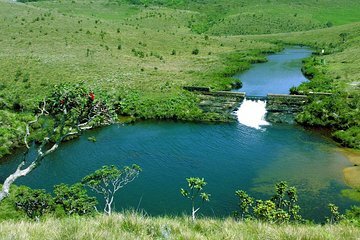 Explore Horton Plains National Park, a UNESCO World Heritage site, before enjoying a guided walk to scout for wildlife as you journey to ‘World’s End.’ You’ll also visit Baker Falls, enjoy an included lunch, and visit a tea plantation and factory. Receive an early-morning pickup from your hotel in Nuwara Eliya as you travel into the rolling hills of Sri Lanka’s central region, heading toward Horton Plains National Park. You’ll spend the next few hours enjoying a guided nature walk inside this UNESCO World Heritage Site, stopping to observe local wildlife like unique “Hump-nosed” lizards, Bear Monkeys, as you explore the “World’s End” and visit nearby Baker's Falls. After an included lunch served at the Summer Hill Breeze Hotel, you’ll visit a nearby tea plantation and the Pedro Tea Factory, offering an insider’s look at the cultivation and production of this key Sri Lankan product. For a full run-down of the day’s itinerary, please review the itinerary details below.